Times are changing -- both nationally and locally -- for the annual Labor Day weekend Muscular Dystrophy Association telethon. In fact this September's dramatically shortened event won't be on Labor Day at all this year. Nor will it be hosted by Jerry Lewis or carried in D-FW by NBC5 (KXAS-TV), which has been instrumental in local fundraising efforts for decades. NBC5 vice president of programming Brian Hocker confirmed the dropout Monday, saying that "it's been 38 years by my count" that his station has been the local face of the MDA telethon. KXAS personalities such as Mike Snyder, Bobbie Wygant, Scott Murray and the late Harold Taft had long been associated with the fundraiser. Another D-FW station is close to an agreement to step in for NBC5, but the deal isn't final yet. Let's just say that the new North Texas telethon carrier will not be one of the four major broadcast stations. Until a deal officially is made, an off-the-record agreement ethically prohibits me from saying more. The 85-year-old Lewis, who has hosted the telethon since 1966, announced in mid-May that he'd be retiring from those duties save for a brief appearance to sing his signature walk-off song, "You'll Never Walk Alone." The new hosts are Nigel Lythgoe (executive producer of American Idol and the head judge on So You Think You Can Dance), Entertainment Tonight co-host Nancy O'Dell, Allison Sweeney of The Biggest Loser and veteran entertainment reporter/producer Jann Carl. The telethon also is cutting back to a six-hour telecast that MDA officials say will air from 6 p.m. to midnight in all time zones on Sunday, Sept. 4th. That's a substantial decrease from the 21.5 hour format that MDA had used for 45 years. In making the announcement, the organization said it hoped that a drastically shortened telethon "could well attract more television stations into MDA's 'Love Network'. " That may end up being the case. But NBC5 is owned and operated by its network, which apparently is reluctant to relinquish six hours of prime Sunday night real estate near the start of the 2011-12 TV season. Previously on KXAS, substantial portions of the telethon had been preempted by commitments to NBC entertainment and sports programming. 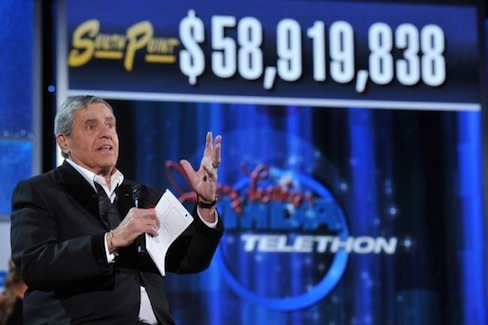 The MDA says that "more than 160 stations" so far have committed to carrying the new streamlined Sunday night telethon.